Welcome to the final chapter of the Assassin Nation Plot, and its been one hell of a ride since the start. World leaders are dead, countries are being blamed, villains are dying, but the truth still hasn't been revealed. This issue starts off with some bad news, Spidey's getting rejected for security clearance for the Pentagon! The guard can't comfortably let him have a pass not knowing who he is. That's pretty tough on the poor guy, and Spider-Man leaves in a hurry to his aunt's boarding home. The next day at the Pentagon in Washington DC, Spidey manages to sneak into the building which surprises Cap and Sable, and kind of pisses Cap off. He drops a hint of something the Wall-Crawler could do, and they head their separate ways. Spider-Man's next move is definitely one of his more riskier ones. He steals some Ultimatum Soldier hear and pretend to be a soldier releasing Toler Wiel from his cell! He tosses a Spider Tracer on him and keeps close behind. The chase leads Spider-Man to the National Archives! All seems quiet until...it's not quiet anymore, and Spider-Man's attacked by some soldiers who he quickly disposes of. The place much be crawling so he's gonna make a more secretive escape, and jumps through a vent. A couple air vents later, our Webbed Wonder finds himself looking in on multiple soldiers from different groups all trying to get into a safe, probably all hiding the US' oldest documents!!! After another round of Let's Beat Up The Baddies, we are introduced to the true mastermind of this entire story arc: The Red Skull! He reveals he doesn't want to steal the documents, but to destroy them! And blame it all on Symkaria so they could go to war and once that happens, it'll be easier for the Skull to destroy the country. He even tries bribing Spider-Man with one million dollars to help him. What do you think his answer was? Of course he took the money! Things ain't cheap these days!!! Ok, fine, he didn't, but it's always fun to dream. He passes on the money and starts up another fight, giving the Red Skull the perfect opportunity to escape, and he does just that. Luckily, Spider-Man stops the bomb on time, but it too late to catch the Skull and he successfully escapes. Before leaving the scene, Spidey grabs his camera with fresh pics for the Bugle AND a nice little tape recorder which captured all of the Red Skull's words. With that, the US has enough proof to show it wasn't them who murdered the Symkarian Prime Minister and the tensions can now die down. A huge bomb (literal and symbolic) was stopped here and what an incredible ride it's been. I loved every issue of this story, and I hope the last issues of this Omnibus can have a bang of that size. The one thing I didn't like about this issue is ironically the thing I like most about comics, the cover. 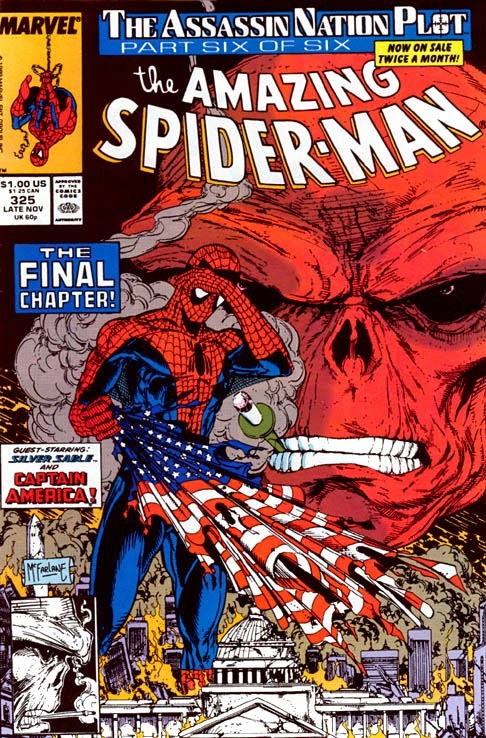 This cover showed the Red Skull, a character not even mentioned in this entire story, so they kind of blew who the mastermind was before anyone could even read what's inside. That aside, this was a great wrap up issue with amazing artwork and lots of action. Be back in a week for more Spidey action as the Michelinie/McFarlana Omnibus comes to an end soon.